I talked to Thomas from Dreamworlds about the German Indie scene, the problems of being indie, his game Splatter and the difficulties we both had with stories in games. Hi Thomas! Please tell us who you are, and what you're doing at Dreamworlds. Jo moin! I'm Thomas Ziegenhagen, currently 34 years old and married since 2 weeks. I founded Dreamworlds a long time ago together with my twin brother. I'm mainly a programmer, but also do everything else needed - graphics and sound to help out, game design, writing dialogues, organization, etc. My brother and I have started at the age of six on a small GDR computer. The first game that reached the thin public on the Internet was a pure multiplayer spaceship shooter game called “Crossfire” in 1996. Much later in 2003, when I worked for a year in Tübingen and spent too much time alone in the evenings, I started “Splitterwelten”. How came the decision to become “indie” back then? A good question! It was probably primarily this constant bumping against limits. I had so much fun developing games and invested a lot of my free time. But I realized that I would need much more time to implement all the things that I wanted to see realized. So I asked my former employer if he wanted to get involved on a part-time model. As this wasn't possible I quit and started to make a living through game development. I was aware that this wouldn't be easy. But I hoped that the decades-long study of the subject would give me an advantage. Is your brother still on board or do you work alone? No, Stefan is not with me. He remained permanently employed, but hopes for my success to perhaps join later. It is very exciting to be able to work on your own project – you have a completely different motivation than in a profession with externally specified tasks. Of course, for all that the too much and sometimes enormously stressful side-work has to be done as well. How is it to be "indie" in Germany? What is the game scene in Dresden like? And do you think that Germany is generally a difficult place for independent developers? I know some amateur developers here, and there have been other notable indie projects as well. However, we have no regular gathering or something like that, the contact is more volatile, like in forums. Furthermore I do not get funding anymore, even if the German government has initially given me a start-up grant. After two and a half years you could say that I would have to stand on my own feet. I think it's more difficult to live on Indie games here because of the Central-European typical high cost of living. On the other hand, the infrastructure in Germany is outstanding and the social system can intercept the worst falls - a luxury the world envies us rightly. It has advantages and disadvantages to work here. 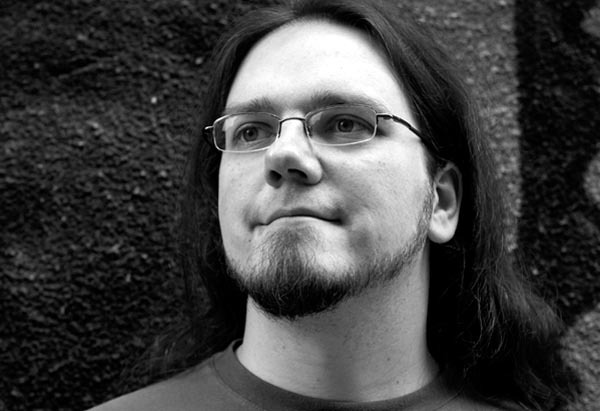 And what do you miss, what would help you in the development of games? To be totally honest: I don't miss anything. Game development is a very difficult field, but in my opinion that's mostly because of the extreme over-saturation of the market. There are quite a lot of game developers in the world who are all highly motivated and also very talented, resourceful and dedicated. Each of these people deserves to make a living from their passion as well. But when I look at the whole thing purely selfish, I'd say any additional funding for me by the government would be useful. To make my game better, for example through the early involvement of testers and test coordinators. And to properly promote my games. Just working with the press and the public is a full-time career for itself. Regarding developer tools we now live in a sort of paradise already. I don't think it can be easier and greater than today. How did you develop the idea to make Splatter? Splatter originally started as a contribution to a game development competition in the ZFX forum. 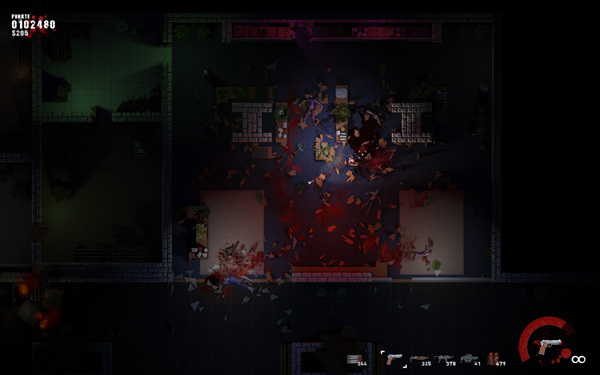 At that time I was only following my spontaneous impulse to develop a top-down shooter like in the good old times. Even the idea of using light radiation to chase around monsters kept running through my head back then already. I upgraded this light and shadow game mechanics to a core element of the current game when I took Splatter up again. It was also intended to be new aspect to the shooter genre, since I have played many games of this genre with great joy but felt a certain repletion after a short time. What was your inspiration for the scenery? I especially notice the natural, down to earth characters that are rather uncommon for the shooter genre. That is more of an issue of conflict. Stylistically I went more in the direction of “Max Payne” - one of my all-time favorites. Which is due to the black and white style in the cut-scenes and the brooding bouts of the main character. He actually is a photo model from the circle of my graphics-artist Michael. To use the photos of friends as characters was a spontaneous idea really and born out of necessity. How important is story in terms of the level design to you ? Or NPC interaction? Very important. If it were up to me only, all the characters had to tell a lot more, and I would have loved to implement a role-playing dialog options system to offer more choices. But I restrained myself as much as possible, because I suspected that most players of shooters have neither patience nor interest to have dialogues. The level design was developed along with the characters. I usually have a basic idea of what should happen in every level - I wanted at least one new game element in each of them, so the game remains fresh and players get new experiences again and again. Characters and the level design are developed as a result of these ideas. I loved the scene with this one girl totally pleased that she is now on an organic farm with no genetically modified organisms, while zombies are running around outside. Tell me more about this down-to-earth world! The village was also such an obsession - a pure dialog level without shooting action in a shooting game. But I thought to myself: why being indie, when I don't take my freedoms that comes with it. I had the idea quite early of a hero getting into almost everything by accident and growing stronger by that. But by following this proposition I found that the story runs entirely speculative until a certain point. Half of the game feels very much like “because the author wrote it”, while a real human being would have said a hundred times “no way I'm doing this, I stay at this nice farm now”. You can destroy every desk, crate, car, basin, window andandand in this game. Yes, you are right. Player motivation is a hard nut to crack. As a developer you just wish the gameplay alone would be motivation enough. With TRI we have also considered different stories to motivate the players. Which is especially difficult when the gameplay already works without a story. Exactly. Then it needs some kind of brilliant idea to catch the people in front of the screen and drag them in. Any kind of story that you write for the main character often feels artificially constructed and constrained for the players. I haven't found a solution for this problem that Splatter has, yet. And considering the fact that the game now has over 8000 words of text already that need to be translated into several European languages, I cannot change much regarding the dialogues. But if I may suggest something from the experience I made with the development of Splatter: Keep the story low and rather deliberately reduced and vague. An extensive and bad story seems to be worse than none. The engine is your own. How important is it for you to develop your own technology? Very important. For a strictly personal reasons - I am a passionate programmer, who has big fun developing technical systems. Especially when they look good as well later. I wanted to also expand my USP. 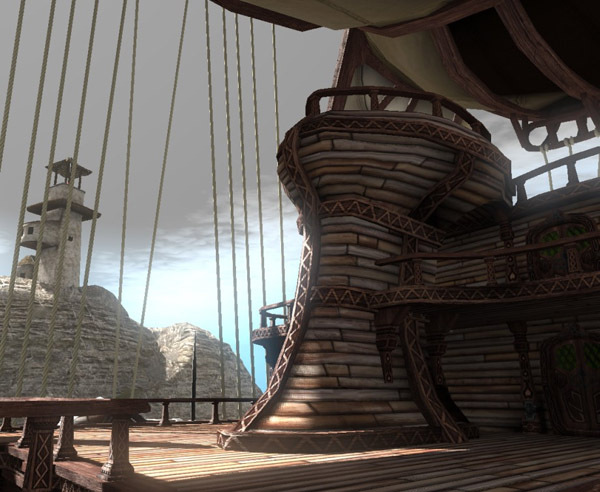 There are many fantastic tools for game creation that make it a lot easier, like Unity or UDK. However, I find that the resulting games usually look too much like their tools. My own technology might give me the opportunity to stand out visually from the myriad of excellent indie games. What would you change in retrospect and what are you most proud of? Looking back, I am of the opinion that the development would not run much different as it went. From today's perspective, I would freeze the development of Splitterwelten earlier – I tried to maintain two projects in parallel for a too long time. I also have some side projects and assignments adopted to keep me alive financially, which is nothing I could have changed. If possible I would probably wait even longer with the release and improve the story scenes, the voice recordings and many details. You just have one chance for a first impression, and this is gone now. 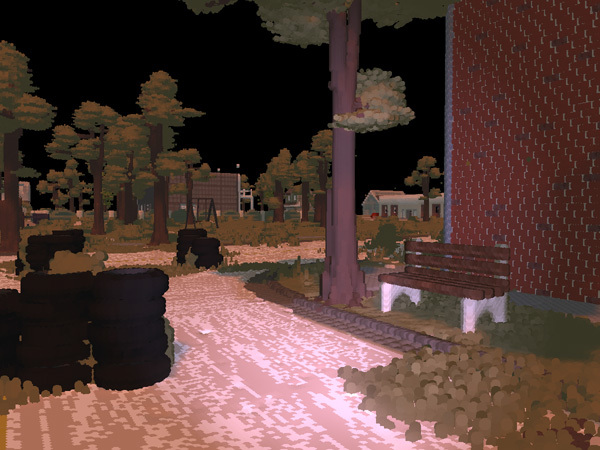 A first screenshot from the upcoming game project. First, I'm currently back at employment. I have to live from something, and Splatter has not been shown successful sales to pay the bills. I will, however, move Splatter even further - more story content, more multiplayer content, maybe I can still get voice recordings for the whole story ... and more. And then there's Splitterwelten which I would love to extend. Do you consider crowd-funding options for Splitterwelten? For a successful crowd-funding campaign you need a good basis of previous public attention. And the biggest and thus most promising platform Kickstarter is unfortunately only available to Americans and the British. I also believe that the crowd-funding platforms are overcrowded. There are a lot of highly motivated teams and projects that compete for the attention and the money of the public, so it is difficult to stand out. The Splitterwelten - Dreamworld's amateur RPG project. Okay, so we are almost at the end, but one question is left: Do you still have time to play? Yes, later in the evening I usually find an hour to play. And there is a lot of stuff that I enjoy, mostly games that I can play with friends. Battlefield 3, Saints Row Coop, long hours Terraria with my wife and many friends while talking via TeamSpeak. I also played Risen II through in many evenings; and I have many, many more games in the Steam library still waiting for an installation. 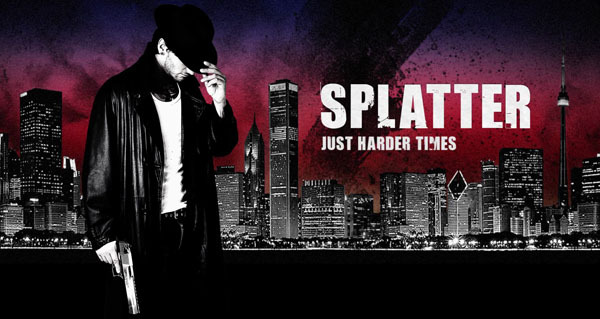 Help Splatter get on Steam!